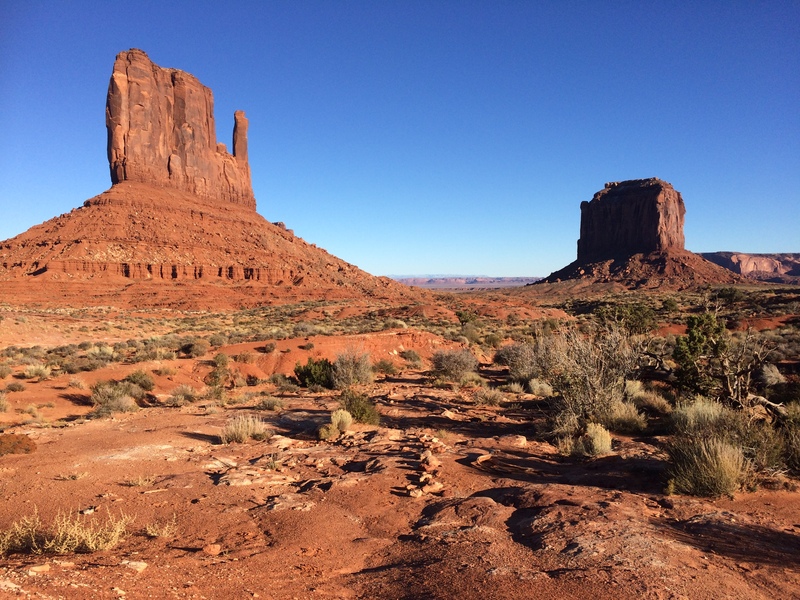 Monument Valley is arguably one of the most famous landscapes in the American Southwest. After watching Forrest Gump, I knew a snapshot of the epic stretch of road leading up into the valley was obligatory. Better yet, I was going to cycle it. 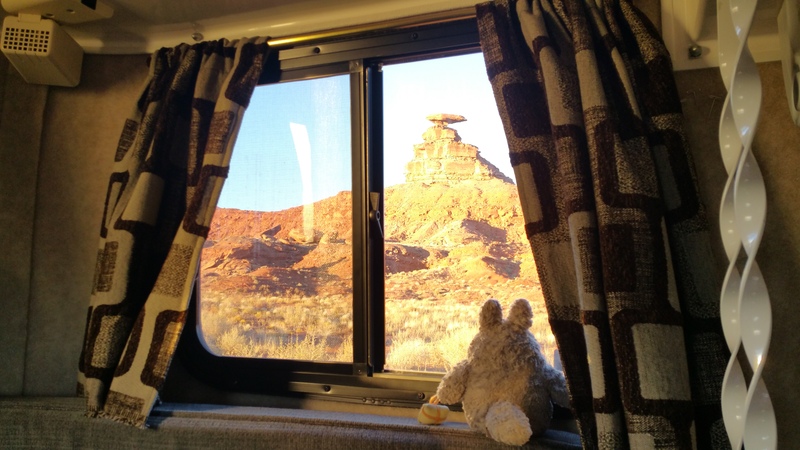 Since we were approaching Monument Valley from the northeast in Colorado, I made note of the number of beautiful sites worth seeing along the way: Mexican Hat Rock, Moki Dugway, and Valley of the Gods. 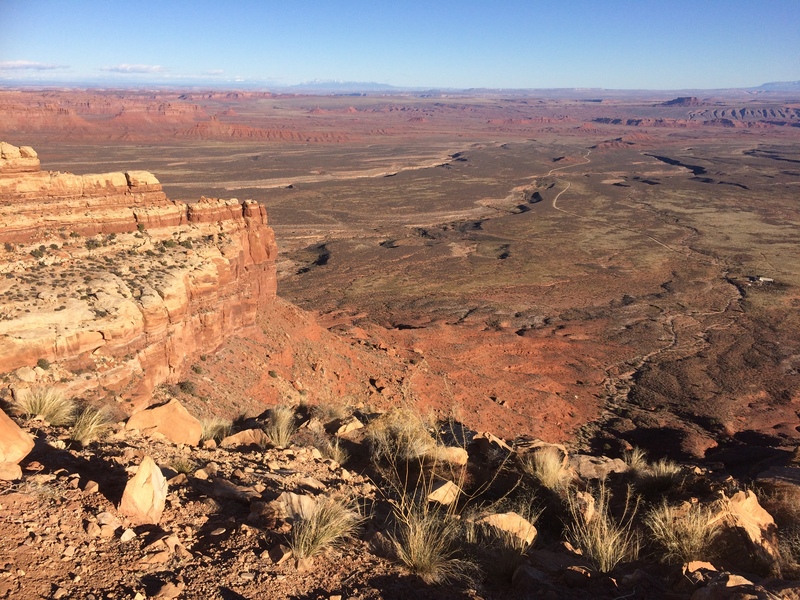 Immediately after hiking the Sand Canyon Trail we set out for Mexican Hat Rock, not because the rock formation was particularly interesting, but because it was surrounded by BLM land. We unhitched Scromp at our new location directly in front of Mexican Hat Rock before embarking on our off-roading adventure. 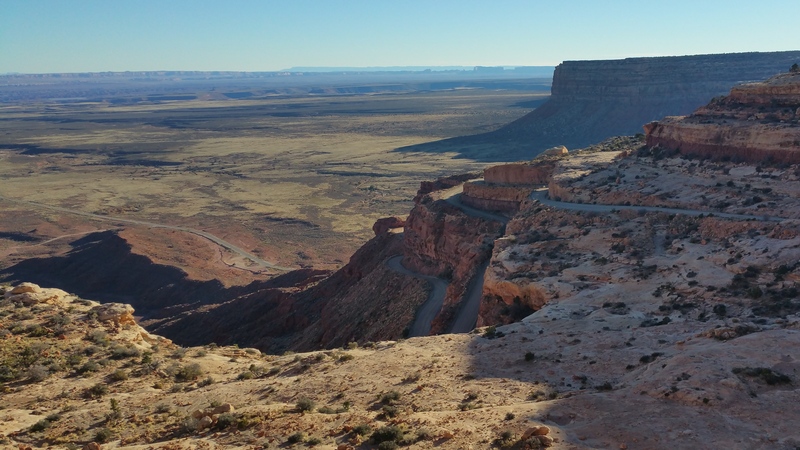 Our first excursion was Moki Dugway, a narrow, steep, twisty gravel road that goes up and over a canyon wall. This section begins just north of the west entrance to Valley of the Gods, and is a must-see if driving through the Valley of the Gods. Once we reached the top, we turned around and drove back down to begin our final excursion of the day: the drive through the Valley of the Gods just before sunset. 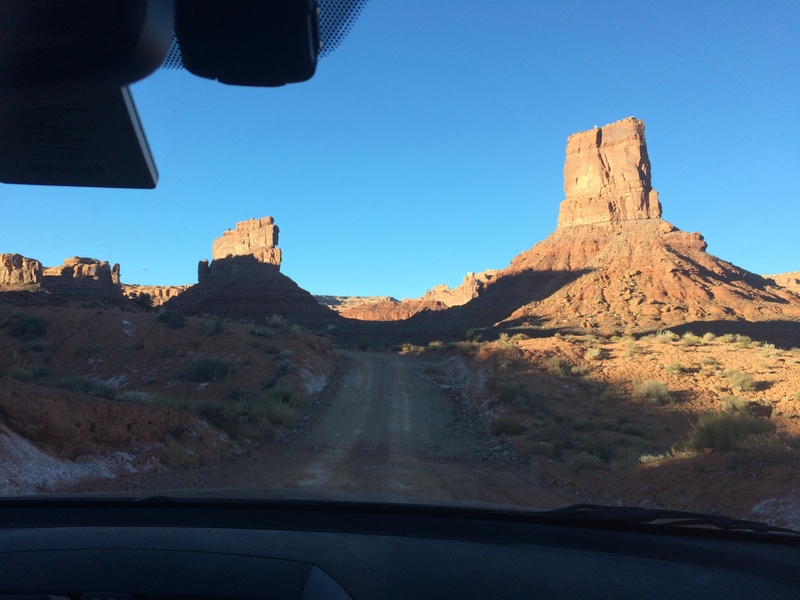 Like Monument Valley, the Valley of the Gods is another 17-mile off-roading adventure through a valley of rock formations and scenic landscape. 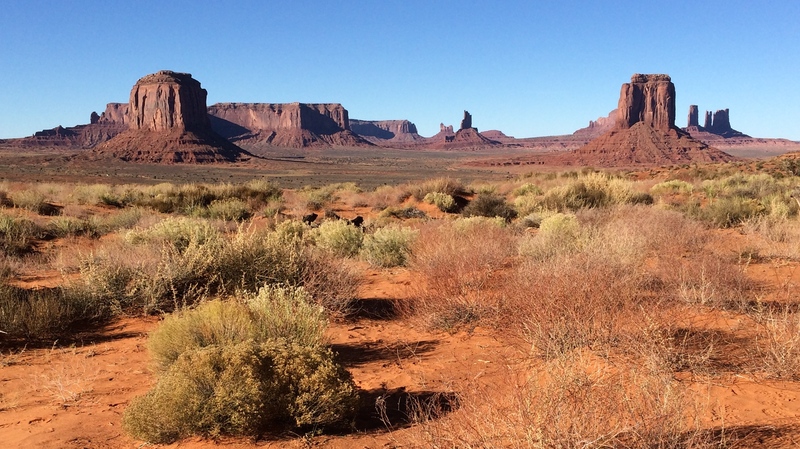 The Valley of the Gods is not far from Monument Valley, and is lesser known, quiet, and free. While driving through this valley, we learned that the entire site is on BLM land, and dispersed camping is located throughout (assuming your car can off-road). There were a couple RVs parked with stunning scenery in the distance. Good to note for the future. 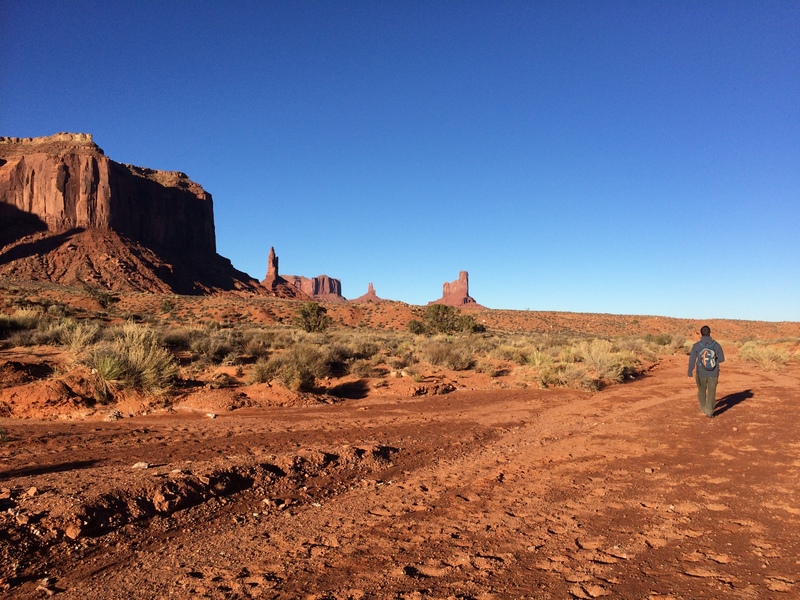 And finally, the next day was my long-awaited adventure in Monument Valley. 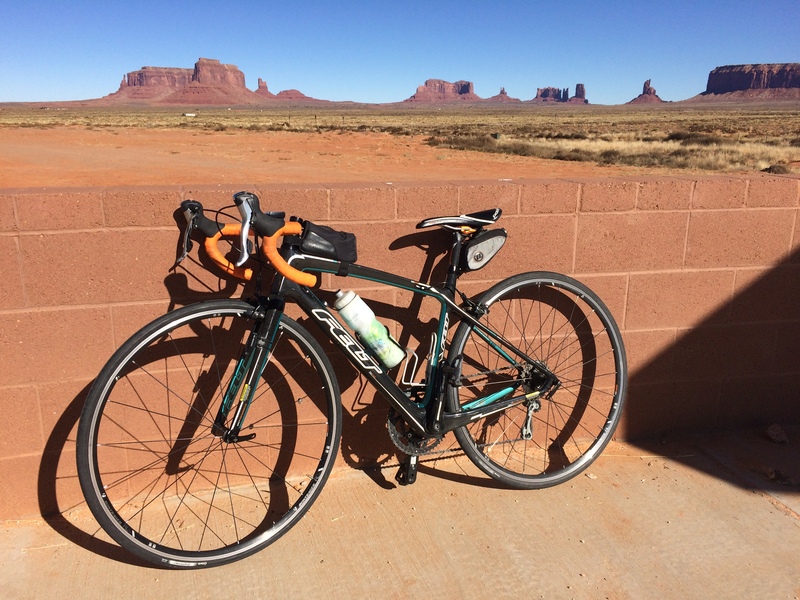 I hopped on my bike and road the 27 miles from Mexican Hat Rock to the Monument Valley entrance booth. It was easy to assume the sparse dessert would be all flatland, but I kid you not, it was hardly ever flat. I either climbed or descended with grades varying from 6%-10%. I slowly climbed past horses along the side of the road that looked at me inquisitively, and I zoomed past looming desert rock formations. 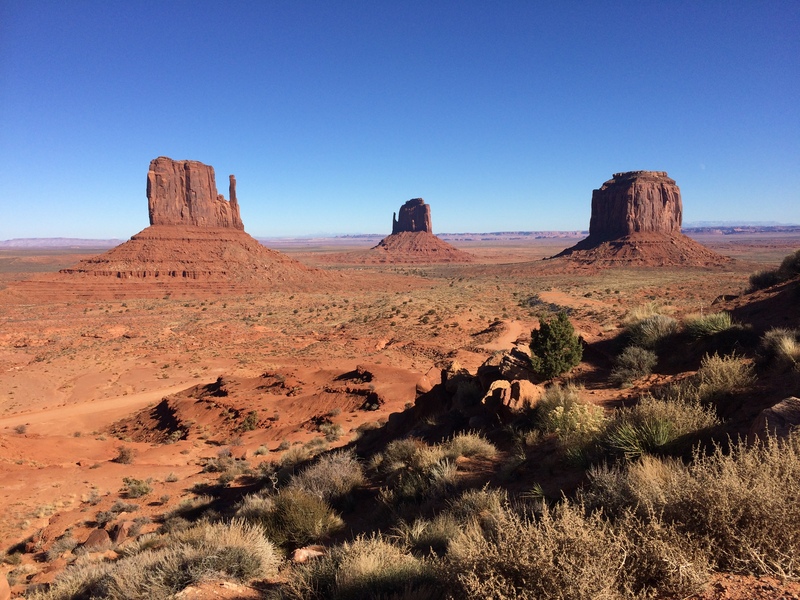 As Monument Valley grew in site, the smile across my face widened with delight. 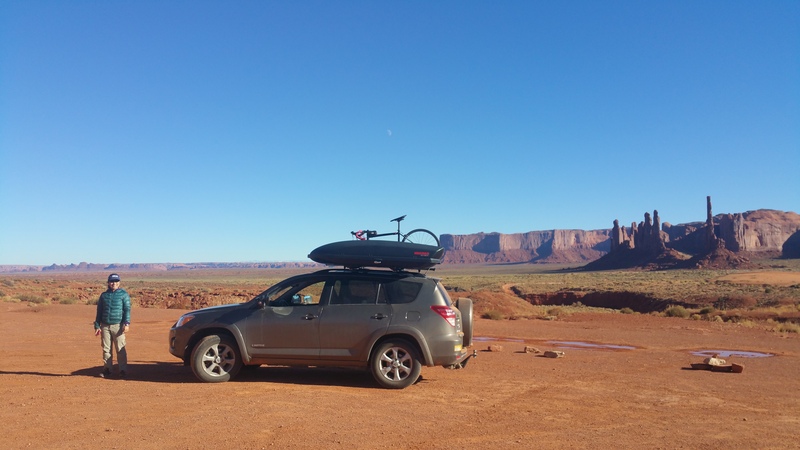 On the famous road leading to Monument Valley, it was common to see cars stopped in pullouts in order for drivers to snap a picture of this scene. Fortunately one driver was kind enough to take a picture for me. Forrest runs. I ride. As planned, Chris met me at the entrance booth, where I loaded my bike into the car, changed, and got dressed to hike. 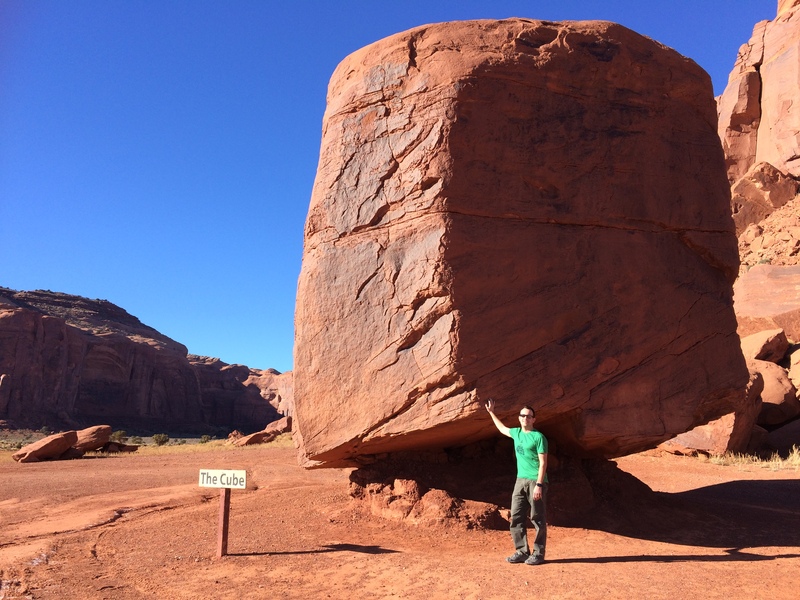 It cost $20 per vehicle to enter; Monument Valley is Navajo land, not a national park! We immediately began our off-roading adventure, which wasn’t as terrible as visitors made it sound. There were at least 3 Fiats driving along the bumpy, unpaved dirt road and if the Fiats can make it, we’re pretty sure any sedan can too. The first landmark of the drive is arguably the most famous site of the mitten buttes. Thanks to the off-season, the whole road was relatively empty. We enjoyed the pullouts and lookouts, typically brimming with tourists and buses, all to ourselves. The best views can be seen from John Ford’s Point. And runner up is Artist Point Overlook. What is said to be a 2-3 hour drive only took 1.5 hours; traveling during the off-season saves so much more time! We finished the drive in time for a sunset hike along the 3.8-mile Wildcat Nature Loop. 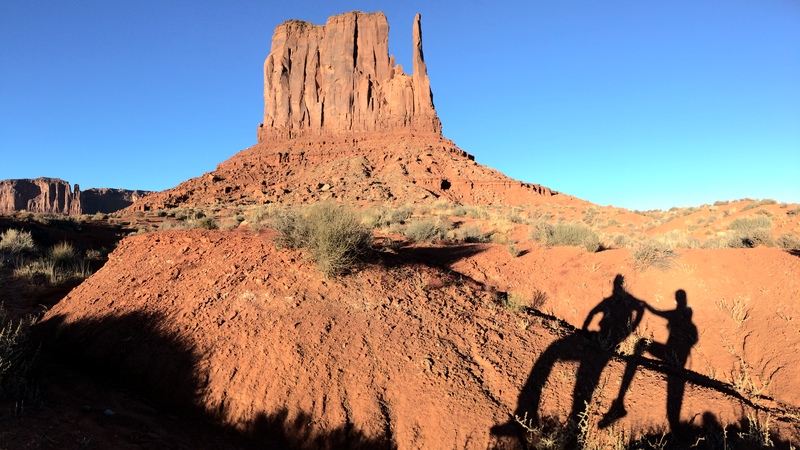 This trail loops around West Mitten Butte along the valley floor, and is the only hike/run visitors can legally do in Monument Valley. But despite being the only hike in the valley, I heard hardly anyone hiked this trail. The verdict? We only saw one runner as we were finishing up our 1.5-hour hike. Bright pink alpenglow illuminated the rock formations as we crossed the parking lot into The View Restaurant after exiting the trail. 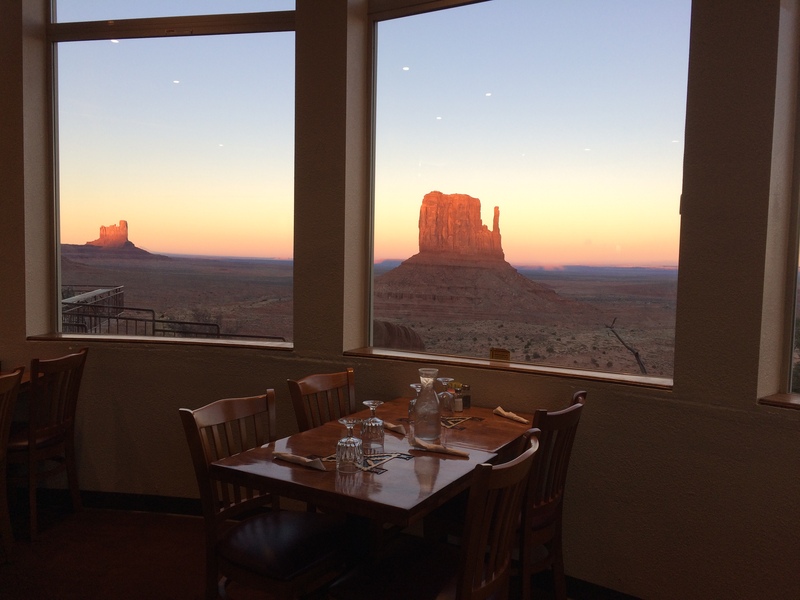 What better way to end the day than a hot meal in a dining room with poster views of Monument Valley? We chowed down on Indian fry bread with honey and fried chicken as darkness swallowed the rocks. 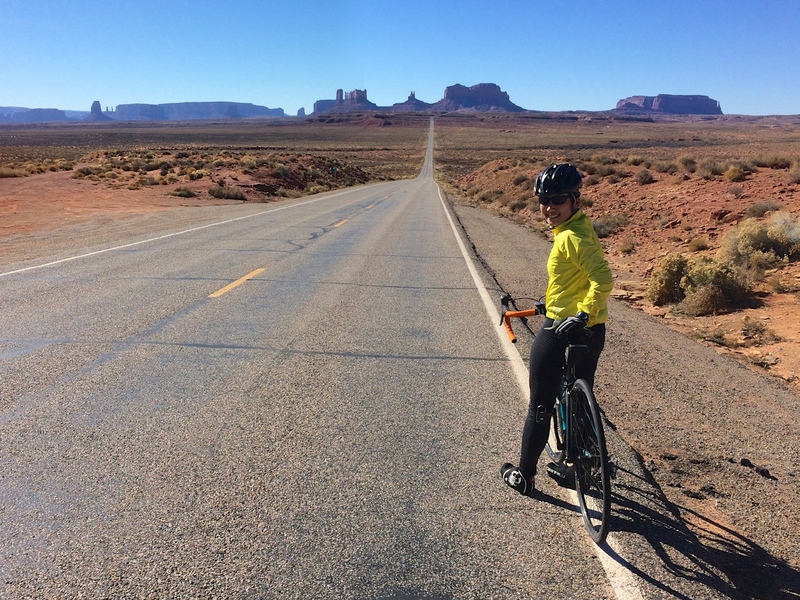 It was an eventful (and logistical) day—I cycled the famous highway leading into the valley, followed by off-roading the 17-mile circuit through the valley, and finished with a hike around the most famous butte in the floor of the valley. NGUYENING! 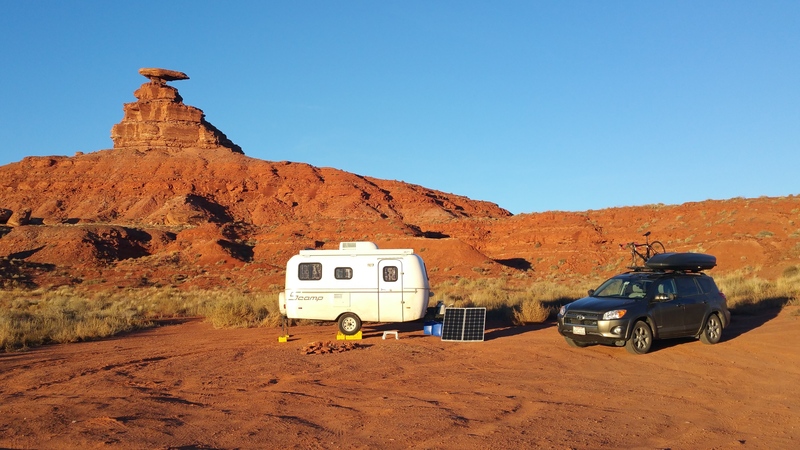 This entry was posted in Utah and tagged mexican hat, monument valley, valley of the gods. Bookmark the permalink.